Muñoz, J.J.; Rabiei, S.; Huerta, A. Numerical techniques for the computation of strict bounds in limit analyses have been developed for more than thirty years. The efficiency of these techniques have been substantially improved in the last ten years, and have been successfully applied to academic problems, foundations and excavations. We here extend the theoretical background to problems with anchors, interface conditions, and joints. Those extensions are relevant for the analysis of retaining and anchored walls, which we study in this work. The analysis of three-dimensional domains remains as yet very scarce. From the computational standpoint, the memory requirements and CPU time are exceedingly prohibitive when mesh adaptivity is employed. For this reason, we also present here the application of decomposition techniques to the optimisation problem of limit analysis. We discuss the performance of different methodologies adopted in the literature for general optimisation problems, such as primal and dual decomposition, and suggest some strategies that are suitable for the parallelisation of large three-dimensional problems. The proposed decomposition techniques are tested against representative problems. 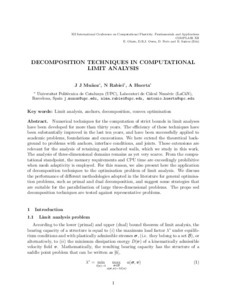 Muñoz, J.; Rabiei, S.; Huerta, A. Decomposition techniques in computational limit analysis. A: International Conference on Computational Plasticity Fundamentals and Applications. "Computational Plasticity XII: Fundamentals and Applications. Proceedings of the XII International Conference on Computational Plasticity – Fundamentals and Applications Barcelona, Spain3 - 5 September 2013". Barcelona: 2013.